Yitzhak Frenkel- ( Frenel) (1899-1981) was born in 1899 in Odessa, Ukraine. He was a great-grandson of the famed Rabbi Levi Yitzchok of Berditchev. In 1917, he studied under Aleksandra Ekster at the Art Academy in Odessa. Frenkel immigrated to Palestine in 1919. In 1920, he established the artists' cooperative in Jaffa and an artists' studio in Herzliya. Later that year Frenkel traveled to Paris where he studied at the Ecole des Beaux-Arts and at the Academie de la Grande at the studios of the sculptor Antoine Bourdelle and painter Henri Matisse. One of the most important Jewish artists of the Ecole de Paris, Frenkel’s contemporaries included Chaim Soutine, Marc Chagall, Amedeo Modigliani, Michel Kikoine, Pinchus, Mane Katz, and Jules Pascin. "House in Zefat" - Oil on board - 34 / 27 cm. 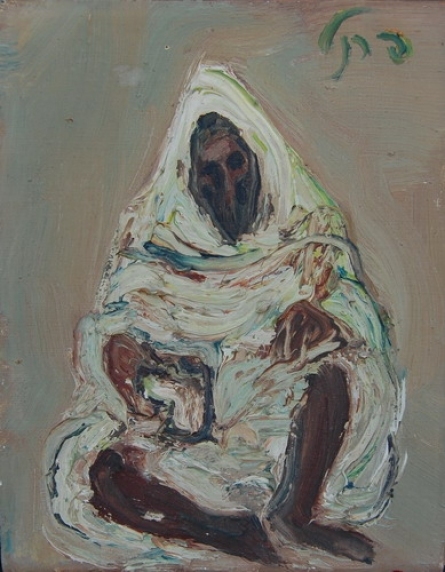 'Oriental Figure' - Oil on canvas - 24/19 cm. Frenkel returned to Israel in 1925 and opened the studio of painting arts of the Histadrut School in Tel-Aviv. His students included Shimshon Holzman, Mordechai Levanon, David Hendler, Joseph Kossonogi, and Ziona Tajar. He was also a mentor to Bezalel Academy of Art and Design students Avigdor Stematsky, Yehezkel Streichman, Moshe Castel, and Arieh Aroch. Frenkel’s paintings favoured the abstract contemporary influences he had adopted during his years in Paris. 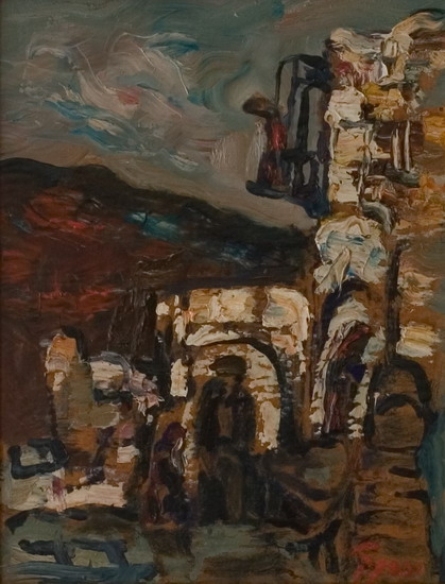 After a five-year stay in Paris, Frenkel made Safed his home in 1934, well before the establishment of the influential Artists' Colony. Among his numerous prizes and accomplishments are the Dizengoff Prize and his participation in the first and second Venice Biennales. "LANDSCAPE IN THE GALIL" - Oil on canvas - 48 / 19 cm. In 1973, a museum of his works was opened at his house in Safed. In 1979, he had a one-man show at the famous Orangerie in Paris. He died in Tel Aviv in 1981 and was buried in Safed.